On February 17, 2018, the University of Arizona Corpus Lab hosted an introductory workshop on how to use AntConc at the 17th Annual SLAT Interdisciplinary Roundtable. The workshop was lead by Adriana Picoral, Nicole Schmidt, Curtis Green, and Shelley Staples, with help from Kelly Marshall, Ali Yaylali, Nik Kirstein, and Yingliang Liu. For this workshop, we changed the layout of our last workshop to better fit the needs and purposes of the attendees at this conference. 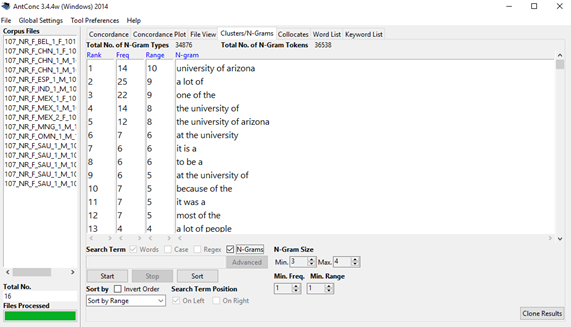 The first notable change was the use of two different corpora: Arizona Second Language Writing Corpus (ASLW) (part of Crow) and Spanish Learner Language Oral Corpora (SPLLOC). 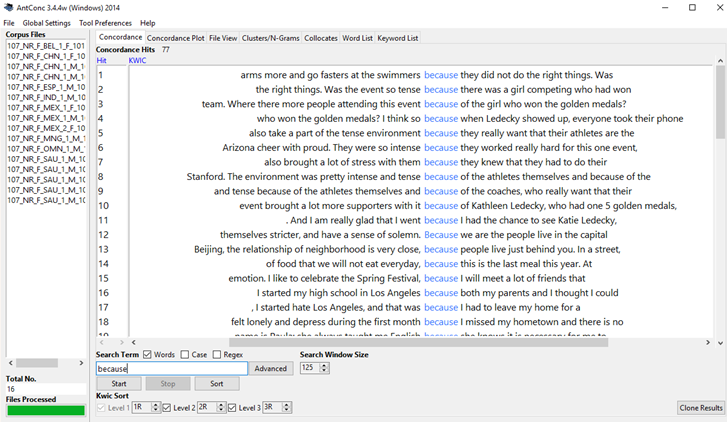 The components we used from the ASLW corpus included Narrative and Rhetorical Analysis student-written papers, while the components we used from the SPLLOC corpus were Modern Times Narrative and Photo Interview files. The goal of the workshop was to help instructors understand how to use AntConc, and how to integrate the application and results into their pedagogy. This was different from our last workshop presentation (given Nov. 21, 2017) where we focused exclusively on the ASLW (Crow) since our audience for that workshop was instructors in the UA Writing Program. Other differences included the space the workshop was in as well as the activities. The workshop was hosted in one of the computer labs in the Modern Languages building. This room allowed for all workshop participants to interact, learn, and explore the AntConc program instead of having to share with another participant like last time. However, since the time slot was only an hour and fifteen minutes (rather than the hour and forty five minutes allotted last semester), we condensed the workshop by covering terms during the activities rather than presenting them at the beginning. The other aspect that was condensed was the number of activities participants completed, from five activities to three. This was also done to allow participants, like last time, to independently explore the program, interact with one another, and ask us questions they had after completing the activities. Before the workshop, we ensured all computers had the AntConc application and the appropriate corpora files in Spanish and English were downloaded. This allowed us to save time and start the workshop promptly, without having to spend the first part of the session instructing participants how to download and access the files and program. This pre-workshop preparation process was necessary because we did not know who the participants were in advance (so we were unable to contact them with instructions on how to access the data). In the future, our corpus data will be more easily accessible through a website, which will facilitate this process. During the workshop, participants were taught how to hide tags so personal, instructor, and other course related information included in the student papers were not displayed in the results. It should be noted that a potential problem with hiding tags is that the output will be limited in the concordance function. Although we did not introduce this issue at the beginning of the workshop, we showed participants how to solve this problem when we presented activities using the concordance function (i.e., unhide tags if more text is desired). The activities focused on instructing participants to search for specific words or N-Grams (contiguous sequences of words, e.g., 1-gram, 2-gram, 3-gram), and how to see these in a list, in the Word List function, or as key words in context (KWIC) in the Concordance Function. When searching in the concordance window, those in the workshop were taught how to select window size, and to search by frequency, range, or word. 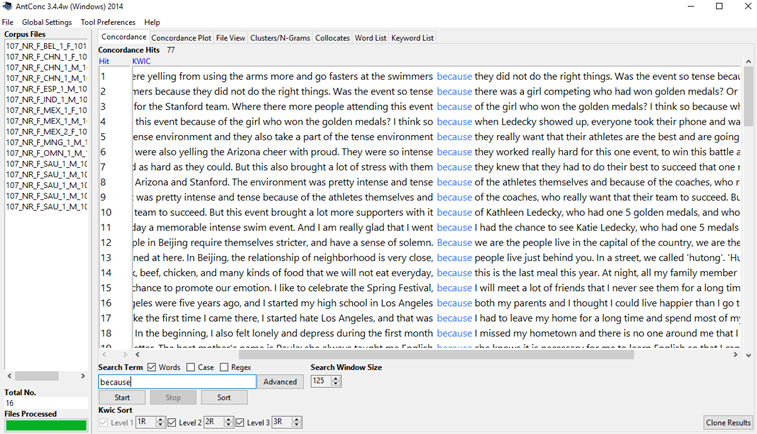 Using the KWIC search shows the words 1, 2, or 3 places left or right of the key word. In addition, participants were taught how to search by prefixes and suffixes, or locate citations by searching “(*)”. While there were notable differences between the two workshops, both had the underlying goal of providing instructors a new approach to create materials and illustrate the pragmatic use of lexical items and grammar in order to show their students the contexts and patterns of words within a specific genre. Moreover, throughout both workshops, we asked participants questions and had a conversation with participants regarding how AntConc could be used to provide authentic writing examples and address common error patterns. The workshop concluded with a discussion, first in small groups and then with the entire group, about how these methods translate into lessons. The teachers were given time to reflect on how they might use what they had learned in their own pedagogy. Here’s our AntConc handout from the workshop.